Coonter-clockwise frae the tap: Oreeginal logo, new logo, oreeginal "fat" model, DualShock 3 controller, later "slim" model. *Aw models can decode Dolby TrueHD an as o firmware 2.30 DTS-HD Master Audio, tae be ootput as LPCM. Ootput o the raw undecodit stream is leemitit tae slim models. 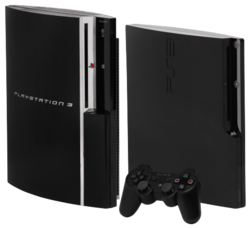 The PlayStation 3, プレイステーション3; Pureisutēshon Surī, offeecially abbreviatit as PS3 is the third hame video gemme console produced bi Sony Computer Entertainment an the successor tae the PlayStation 2 as pairt o the PlayStation series. The PlayStation 3 competes wi Microsoft's Xbox 360 an Nintendo's Wii as pairt o the seivent generation o video gemme consoles. ↑ "Update Features (ver 4.55)". Retrieved February 7, 2014. ↑ "PS3 Slim gains ability to bitstream Dolby TrueHD, DTS-HD MA". Joystiq. 2009-08-21. Retrieved 2010-03-22. ↑ "Entertainment on PS3 has a new look". Sony Computer Entertainment Europe. 2009-08-18. Retrieved 2009-09-01. Wikimedia Commons haes media relatit tae PlayStation 3.